Pack all files in a Playlist loop! Playlists are a great way for organizing and packaging your content. Once your Playlist is created, they can be published to a single Player, or a group of Players. Important:Media files and Apps directly added to the Playlist will always play on full screen. 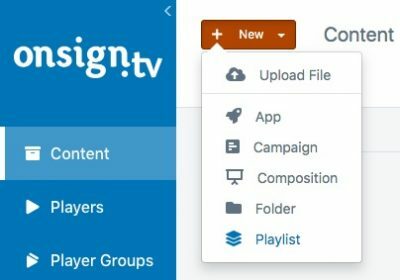 In your OnSign TV account Content page, click on "New". 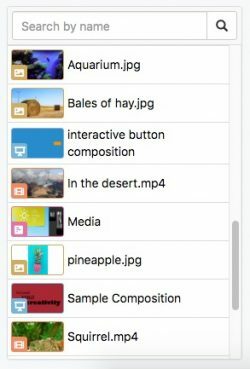 Fill out the pbasic info like Playlist Name, Folder, Category, Tags and cycling. 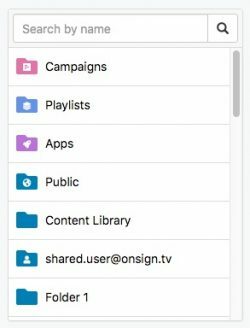 Use the left box to either select: Campaigns, Playlists, or content media files (scrolling down). Drag the selected file or App into the Playlist and move them around if you want to change the sorting order. Click on the gear icon to adjust the display duration for images, Apps and other files. Video files are set to full length duration. 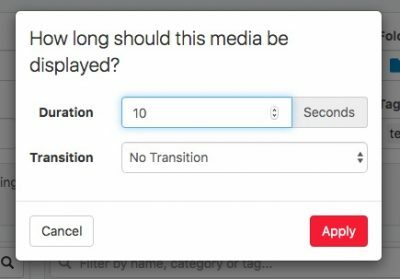 In case you wish to modify the duration, you can also adjust those by through the gear icon.